"When Johansen announced doubleTwist as an extremely early Windows beta a year ago, it was a media manager that could organize music, photos, and video, but it also did DRM-stripping and Facebook file sharing. "Our goal is to provide a simple and well integrated solution," said co-founder Monique Farantzos at the time, "that the average consumer can use to eliminate the headaches associated with their expanding digital universe." 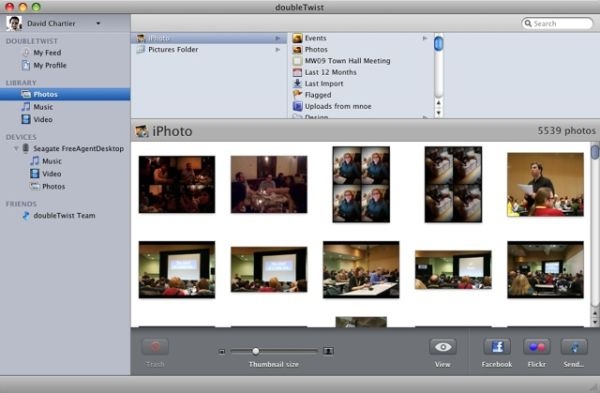 When we looked at doubleTwist in February 2008, it could recognize files like DRMed iTunes media on an iPod, clean MPEG4 video from your cell phone, and everything in between. It could then sync that media back to your desktop or another device, performing any conversions or DRM-stripping as required. "One media library manager to rule them all" was the idea, and while doubleTwist scaled back somewhat for this public Mac OS X beta, it's still quite an interesting product." This is pretty cool. I just purchased and iPod and was lamenting the hassle of having to have different file formats (especially for video) and syncing software for each device. Looks like this will allow you to have one centralized media library in one format that will then sync and convert on the fly to whatever particular device you want the content on, be it an iPod, Zune, phone, gaming device, etc. do you think this would convert dvr-ms files and transfer them to an iPhone/iPod Touch? I was thinking of getting an iPhone (if they come out with a better this June) so this would be perfect.